Meet Ben! This beautiful dog raced under the name of Tobin Frost, and is now living in South Carolina courtesy of Greyhound Crossroads. He is said to be good with children, but not tolerant of cats or small dogs. Here’s what their website has to say about him. Ben came from a kennel closing at the Sanford Orlando Race Track. He is a small red male that raced at 68lbs. He is 2 years old and won’t celebrate his 3rd birthday until Oct 9th. He has 32 races to his credit. A few at Gulf in Texas but most at Sanford Orlando. We also got his littermate I’m Sasha Fierce from the same kennel and petted her out quite awhile ago. His sire is the very famous Dodgem By Design and his dam is JT Hyper Jax. Ben is much too interested in chasing cats to be able to live with them and mistakes smaller dogs for bunnies too. He has done well with medium to large sized dogs that he has met though. You will want to look at his other photos to see photos of him as a tiny puppy that his racing owner took. So cute!! Another photo of him running and dragging the lead out at the track towards the box in a huge hurry to race. Ben LOVED racing! Ben is outgoing and very friendly. He is interested in checking everything out and seems very curious but calms down quickly and is a real couch potato at home. He is an easy going guy that takes everything in stride. He is smart and has picked up on leash walking fast and potties on leash. Ben has done great with the kids he has met and seems to really like them. He loves water and loves to cool off in a kiddie pool at his foster home. Ben had a unique upbringing and got a lot of socialization as a pup. His litter got parvo when they were tiny and spent a few weeks at a vet clinic being nursed back to health. He made a complete recovery and ended up being healthy enough to race. He is a very lucky boy. He is a friendly, confident, well adjusted boy that has been very good in his foster home and is one of her easiest fosters ever. Ben will need a home with another dog because he has shown that he can be stressed by being left totally alone and does better when people leave if he has another dog to be with. Wouldn’t you love to be able to retire at two years old? 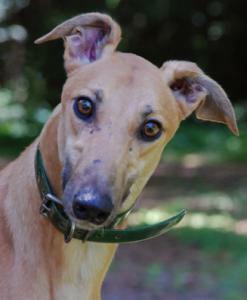 Just an FYI, Greyhound Crossroads will be getting some new dogs tomorrow (8/19/13), so you may want to check back with them if you don’t see the dog you want today. If you’re going to be near South Carolina, why not contact Greyhound Crossroads and ask to meet Ben and all of his friends. Fill out an online adoption application, drop an e-mail to joanne@cybrmedia.com or call (864) 229-2696. If you’re somewhere else, check out Petfinder’s Shelter Center for adoptable dogs near you!